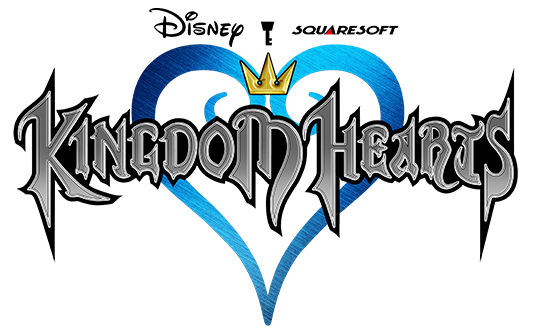 In Kingdom Hearts you follow the story of a young boy from Destiny Island named, Sora. He, along with his childhood friends, Riku and Kairi, dream of eventually leaving their tiny island home in search of adventure on distant lands. Then, one fateful night, Destiny Island is beset by a legion of dark, shadow creatures known as the Heartless. Riku vanishes. A mysterious door appears in a small, untouched cave and Kairi is pulled into the unknown. Alone, Sora must journey through the realms of Disney and Square Enix in order to find his friends, and unravel the secret of the darkness. Kingdom Hearts (2002) is an action RPG that was first released on September 17, 2002 for the Playstation 2 by Squaresoft (now Square Enix). It is one of my most anticipated games, of all time. I don't think there's another game that drew me in with all the hype and delivered so viscerally as this game. Even before it came out, I was devouring any piece of new media for the franchise. It was a union between two of the greatest story telling giants in the industry: Disney and Squaresoft. I had grown up playing Squaresoft games like Final Fantasy, Chrono Cross, Chrono Trigger, Parasite Eve, and of course I was a huge fan of anything Disney. Aladdin, Beauty and the Beast, The Little Mermaid, Hercules, and on and on! It was one of the greatest cross overs in my entire life. You take control of Sora and have the ability to roam freely through the different worlds. Sora can run, jump, dodge, and eventually learns to glide and swim. Tasked with wiping out the coming darkness, Sora is given the Keyblade: a magical weapon that can unlock the heart of worlds and people. Combat is is smooth and very engaging. Fights are quick, and as the story progresses you gain new techniques, like magic and combos, that add to the strategy of battle. it's up to Sora, Donald and Goofy to set things right. It's also really nice to be able to fight alongside Disney characters, like Aladdin, Jack Skellington from Nightmare Before Christmas, Hercules, Ariel from the Little Mermaid, and of course Goofy and Donald. Each has their own special abilities and the A.I. is incredibly intuitive! I never found myself struggling with them in the heat of battle! You're right there with Sora every step of the way! Helping him learn about the Heartless, traveling from world to world, and making new companions as he seeks to reunite with Riku an Kairi. You experience the the world of Kingdom Hearts together and grow as he grows. And when you inevitably find Riku and attempt to rescue Kairi, the game continues to keep you invested through the writing, the music, and puts you in the heart of the chaos! It's really engrossing, which makes the emotional moments all the more impactful. The animation is very well done. Characters move fluidly and have very stylized designs: big feet, large hands, doe eyes, crazy hair, and big cartoony heads. Faces and bodies squash and stretch to fit any emotion, and the models are very faithful to the original source material. Disney characters are fully fleshed out to exact proportions. The Final Fantasy characters have a new look, but the revamped style not only merge seamlessly into the universe, but also gives them an interesting redesign that's both new and faithful to Tetsuya Nomura's original ideas. due to their unpredictable nature. It's a brilliantly colorful world that players will be familiar with. But it's also new and intriguing as the worlds are expanded upon, beyond the stories that we all know and love. They aren't just separate universes. They're realities tied together by the darkness, and the corruption of every Disney world is a sight to behold on its own. Each new world brings new Heartless, with strange animations that set them apart not only visually, but in pose and action as well. 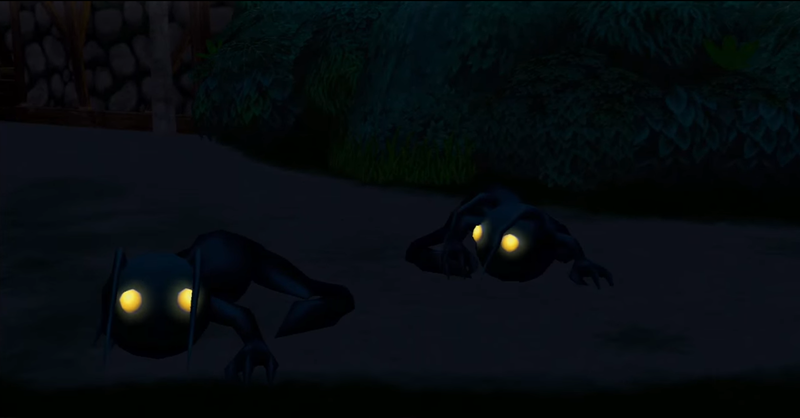 There's something off putting about every Heartless you meet, and that's due in part to the attention given to their movements, stances, and subtle animation. I also wasn't a huge fan of a few levels. Their design and just in general. I didn't enjoy swimming in Atlantica, searching through Alice in Wonderland was a chore, while Monstro (The Pinocchio theme level) was a tediously boring maze. That, and the timed mini games in the Hercules Coliseum. I hate anything set to a time limit in any game. And the wonky camera and finicky lock on system did nothing to alleviate the stress from trying to kill barrels, to a timer. on how they fit into the world. However, the biggest issue with Kingdom Hearts was definitely the lack of anything related to Square Enix's juggernaut, Final Fantasy. 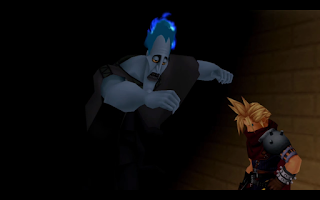 While every Disney movie had its own world, with well known characters that tag along for the journey, not one member of the Final Fantasy roster aided you in actual combat. And they all came from a single world, known a Hollow Bastion. One world? For every Final Fantasy character? There wasn't a Final Fantasy VII world based on Midgar, or a world based on Final Fantasy VIII where you explore Balamb Garden or something related to that game. I feel like Final Fantasy was severely short changed, and it's sad, because this was a golden opportunity to expand and revisit some of those universes. Oh, and SPOILERS, they brought back Aerith. A beloved character that everyone wanted back, and her appearance is heralded with little fanfare. That and she finally sees Cloud again! And not in any important part of the game, no. In a small cut scene during the credits. Really? Still, Kingdom Hearts is one of my favorite games of all time. The story is deep and moving, the characters are interesting, and the journey to stop the Heartless is imaginative and epic. The orchestral score (Composed by Yoko Shimomura) is spectacular, especially the opening theme song Simple and Clean by Utada Hikaru. And I can't end this without talking about the ending. Wow, it still gives me shivers. Definitely one of the best endings in video game history, period. I am expecting big things from Kingdom Hearts 3!